Power Monitors | Yokogawa United Kingdom Ltd.
Real-time power consumption monitoring is the first step to saving energy. Learning real-time power consumption by monitoring your system is the first step in saving energy. 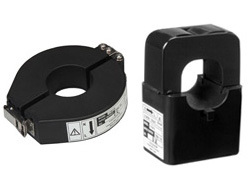 The CTW Series are clamp-on current transformers that can be installed much easier than conventional current transformers, whereby saving installation cost. Easy installation/dis-installation, ideal for specific measurement support wide variety of measurement functions such as fundamental power parameters, electric energy, demand and harmonics.